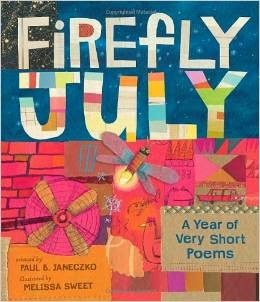 Firefly July: A Year of Very Short Poems by Paul B. Janeczko, illustrated by Melissa Sweet. Sun's a roaring dandelion, hour by hour. Sometimes the moon's a scythe, sometimes a silver flower. But the stars! all night long the stars are clover. Over, and over, and over! - Robert Wallace, "In the Field Forever"
What greater gift on the bookshelf than a perfect anthology of poems? This lovely, over-sized tome of thirty six well-chosen treasures takes us through the wheel of the year with evocative and colorful full-edge mixed media. The only complaint might be wishing the "very short" ride would never end, but open it back up, and the seasons begin again. A book that would be relished as a gift, and a lyrical read-aloud treat for teachers as well. 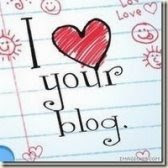 Link for information; please support your local independent bookseller.